Although penguins live on the land, they hunt for their food in the sea. Most swim 5-6 mph. Some reach speeds of up to 15 mph. Guess how they do it! It’s called a “bubble boost.” Fluffing their feathers when they swim, they release bubbles that lower the density of the water around them. Much like a competitive swimmers’ suit, these bubbles provide lubrication that reduces water viscosity and allows them to glide through the water more quickly and easily. Here’s another amazing survival skill penguins possess: Even though they can’t breathe underwater, they can remain submerged for 10 to 15 minutes before they need to come up for air. At Air Professionals, we know more than fun facts about penguins—our cool techs also know everything about what makes furnaces tick. We have the tools and skills to keep them functioning at their very best. Whenever you need a furnace repair, we will glide on over to your igloo (or more conventional home) in Bridgewater, Hillsborough, Flemington, Clinton and nearby to provide the top-shelf products and impeccable service you deserve. Don’t Delay. Call Us Right Away! Your system is more than 15 years old. Your energy bills are skyrocketing. We’ll bring a van stocked with everything we need to repair your furnace on the first visit—every visit. Whatever you throw at us, we have the skills, experience and tools to restore your system. Can our techs get any cooler than that? Well, actually, they can. They’re NATE-certified and specialize in taking broken furnaces under their wing to nurse them back to health—no matter what make or model you own. Of course, furnace repairs don’t always happen when it’s convenient. They happen in the middle of the night, on weekends or when your house is full of guests for dinner or a special celebration. That’s why Air Professionals is available all day, every day to handle your emergency service. 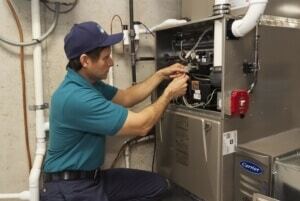 We’re pros at furnace installation, furnace replacement and heat pump repair and replacement. We’re so confident in our products and services that we offer a 100 percent guarantee along with affordable financing plans. Air Professionals is here for everyone in the colony! We will glide on over to handle all of your furnace repair services in Bridgewater, Flemington, Hillsborough, Clinton and beyond. Call Air Professionals today at 908.238.3732 or contact us on the web.